Robert Stephenson Smyth Baden-Powell was born at 6 Stanhope Street (now 11 Stanhope Terrace), Paddington, London, on the 22nd February 1857. He was educated by his mother (his father dying when BP was only 3) and earned a scholarship to Charterhouse School. When he took the open examination for the Army, he gained second place for cavalry, and was commissioned straight into the 13th Hussars, missing all the Officer training, and ended up being their Honorary Colonel for thirty years. While BP was in the 13th Hussars, he served in India, Afghanistan and South Africa, and was also mentioned for his work in Zululand. Then he served for three years in Malta as Assistant Military Secretary and then he was sent to Ashanti, Africa, to lead the 5th Dragoon Guards in 1897 at the age of 40. It was with the 5th Dragoon Guards that BP gave his first training in scouting, and awarded soldiers reaching certain standards a badge based on the north point of the compass. Today's Scout Membership Badge is very similar. In 1899 came Mafeking, and during the 217 day siege, BP became a Major General. He became famous and was the hero of every boy, although he played down his own part and the value of his leadership. Following Mafeking, BP was given the task of organising the South African Constabulary, and it was not until 1903 that he returned to England as Inspector General of Cavalry, and found that his book, Aids to Scouting, was being used by youth leaders and teachers all over the country. 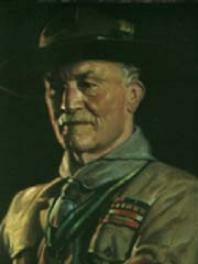 After talks with Sir William Smith, the founder of the Boys Brigade, BP set to work rewriting Aids to Scouting. In 1907, he held an experimental Camp on Brownsea Island, Dorset to try out his ideas. He brought together 22 boys from all different backgrounds, and put them into camp under his leadership. BP retired from the Army in 1910 at the age of 53, on the advice of King Edward VII, who suggested he would do more valuable service to the Boy Scout Movement (now Scout Movement), than anyone could as a soldier! 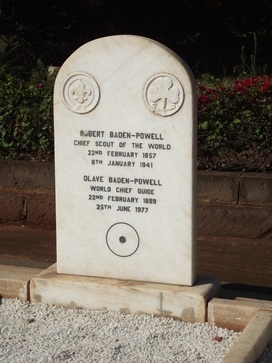 He travelled the world to promote Scouting, and its sister movement, Guiding. He died in 1941. But the real way to get happiness is by giving out happiness to other people. Try and leave this world a little better than you found it and when your turn comes to die, you can die happy in feeling that at any rate you have not wasted your time but have done your best. "Be Prepared" in this way, to live happy and to die happy - stick to your Scout promise always - even after you have ceased to be a boy - and God help you to do it.